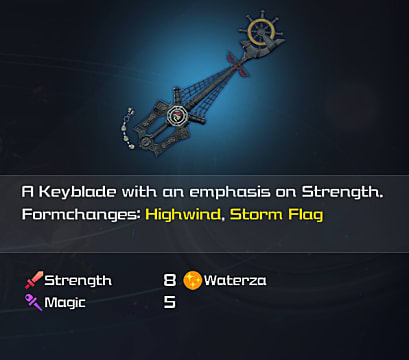 Kingdom Hearts 3 has multiple Keyblades to choose from, and they are all unique. Some Keyblades are better suited for magic, some for physical attacks. Most of them have game-altering form changes. With so many options, it can be hard to keep track of all the Keyblades and what they do. This guide will make that easier. 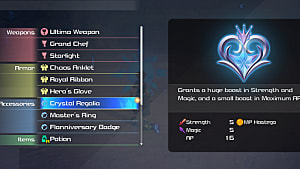 Here we have a sort of Keyblade list, going over each of the ones obtainable in Kingdom Hearts 3 along with their stats, special skills, and form changes. Keep in mind that there will be slight spoilers that reveal where you get the later Keyblades. 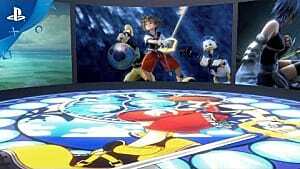 Second Form is just an enhanced version of Sora's normal fighting style. It adds wider area attacks and a Stun Impact finisher that stuns enemies. Treasure Magnet automatically draws in and collects nearby loot, and you can stack the ability to increase the effect. 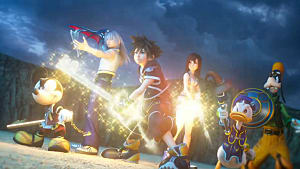 You get these Keyblades by pre-ordering a copy of the game. Microsoft Store pre-orders come with Phantom Green, Playstation Network pre-orders grant Midnight Blue, and Amazon pre-orders give players access to Dawn Till Dusk. 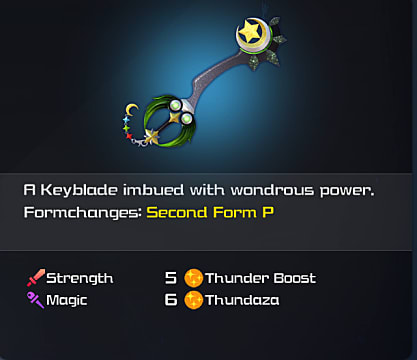 These Keyblades all have a version of Second Form, but the form change behaves the same way across all three of them. Regarding Elemental Boosts, Phantom Green gives Thunder Boost, which increases Thunder damage by 20%, and unlocks the Thundaza situation command. Thundaza is the highest version of the Thunder spell. Midnight Blue gives a comparable boost and command for Blizzard magic, while Dawn Till Dusk comes with these bonuses for Fire magic. 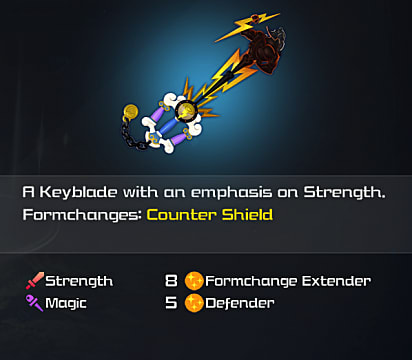 Counter Shield changes the Keyblade into a shield that you can use to block attacks. Each block gives you one charge, and you can hold up to two charges. These charges unleash a powerful strike when you attack. Its Finish Command starts a short ride with Pegasus where you throw lightning bolts at nearby enemies. Defender potentially increases defense by two when your HP is at 25% or below. Double Arrowguns changes the Keyblade into two guns that allows you to shoot in all directions. 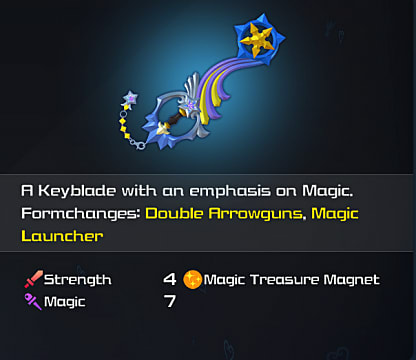 If you continue to build the Form Gauge to max before time runs out, the Keyblade can transform into Magic Launcher. Magic Launcher turns the Keyblade into a huge cannon that can shoot big projectiles at the enemy. Magic Treasure Magnet automatically pulls in and collects loot from enemies defeated by magic. Hyper Hammer changes the Keyblade into a huge hammer that moves slowly but hits hard. 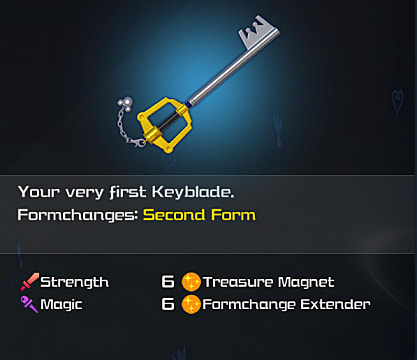 If you continue to build the Form Gauge to max before time runs out, the Keyblade can transform into Drill Punch. 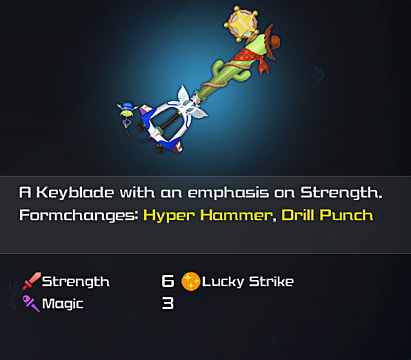 Drill Punch turns the Keyblade into a giant drill that lunges at enemies and can go underground to attack. Lucky Strike increases how often enemies drop items. 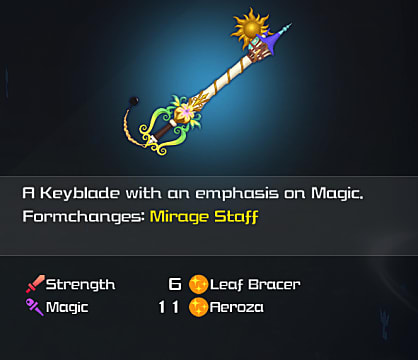 Mirage Staff changes the Keyblade into a staff that shoots rays of light and creates mirage clones of yourself when you dodge. Leaf Bracer allows you to continue casting recovery magic, even if you are hit by attacks in the process. 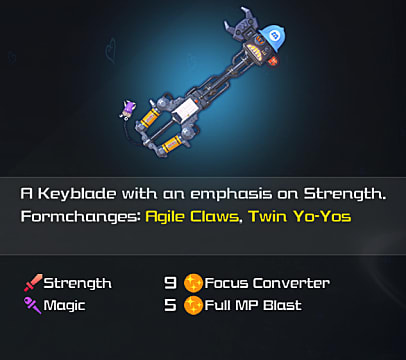 Agile Claws changes the Keyblade into rotating claws that allow you to do damage while using evasive maneuvers. If you continue building the Form Gauge, it can transform into Twin Yo-Yos. Twin Yo-Yos turns the Keyblade into yo-yos that can attack distant enemies and move you close to them. Focus Converter converts all Focus Prizes into large Focus Prizes. This allows you to use Shotlock more often. 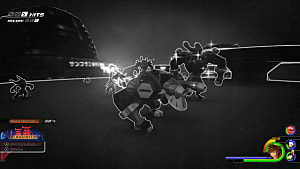 The max Shotlock for Happy Gear allows you to create a network of portals and attack from all directions. 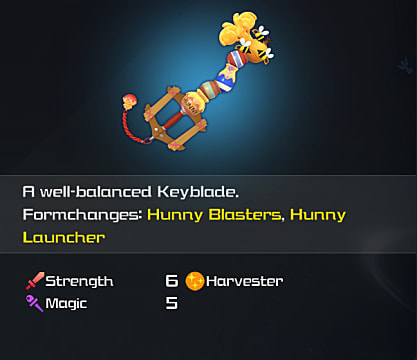 Hunny Blasters changes the Keyblade into guns similar to the Shooting Star Keyblade's form change. Building up the Form Gauge further unlocks Hunny Launcher, which also works like the Shooting Star's Magic Launcher. Harvester allows you to pick up one extra cooking ingredient each time you gather. 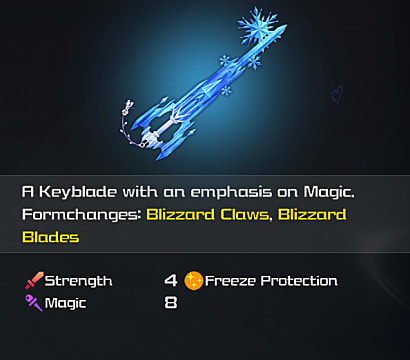 Blizzard Claws works very similarly to the Agile Claws from the Happy Gear keyblade. If you continue building the Form Gauge, it can transform into Blizzard Blades. 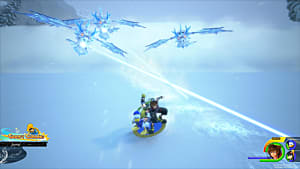 Blizzard Blades gives you ice arm blades to attack with and ice blades to skate along the ground. Freeze Protection prevents you from getting the Freeze status. Highwind transforms your keyblade into a spear that gives all your attacks an extended range. If you continue building the Form Gauge, it can transform into Storm Flag. Storm Flag changes your spear into a flag that can create storms and prevents your weapon attacks from being deflected. Waterza allows you to generate the Waterza situation command without meeting the requirements. 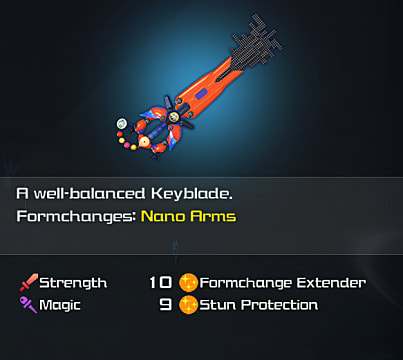 Nano Arms transforms the keyblade into one that uses a combination of the other keyblades' form attacks. Stun Protection prevents you from getting the Stun status. 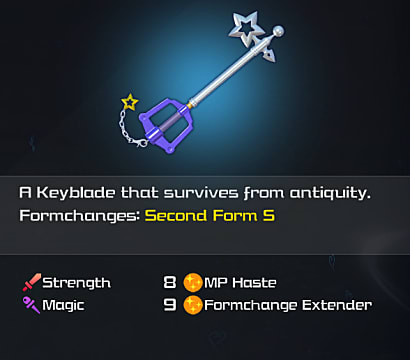 Second Form S is very similar to the Kingdom Key's Second Form, except it has a different ability for the 3rd finisher. Ancient Light is a huge area attack that deals massive damage, which is determined by your Magic stat. MP Haste recharges your MP 10% faster when you run out. Stack the ability to increase the effect. 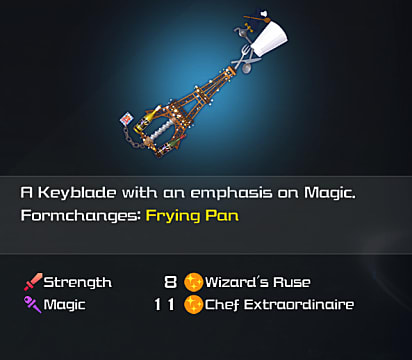 Frying Pan transforms the keyblade into a frying pan that can be used as a shield and use flame attacks. Wizard's Ruse potentially recovers HP proportionate to the MP you use. How to Obtain: Get a high score in all 23 Classic Kingdom mini-games. 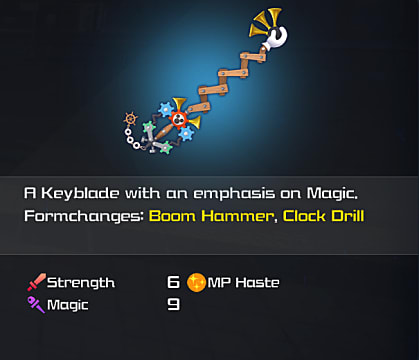 Boom Hammer and Clock Drill work exactly like the form changes of the Favorite Deputy (Toy Story) keyblade. MP Haste recharges MP 10% faster when it runs out and can be stacked. 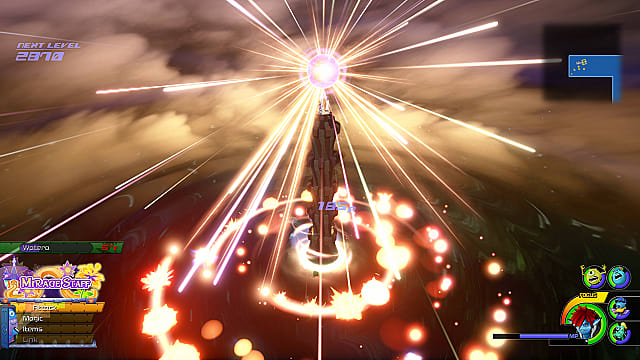 Ultimate Form allows Sora to deal very high damage with wide area attacks. 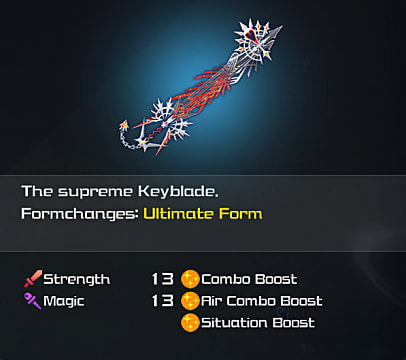 It is by far the strongest of all the keyblade forms. Combo Boost and Air Combo Boost increase damage done by combos and air combos. 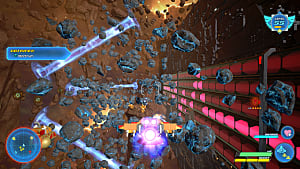 Situation Boost fills the situation command gauges more quickly as you defeat enemies. 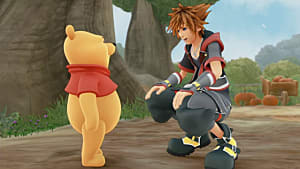 That's all for the this Kingdom Hearts 3 Keyblade guide list. Now you can plan out which Keyblades you'll want to upgrade first in the Keyblade Forge. 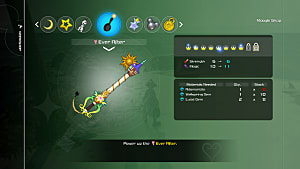 Remember to head over to our Kingdom Hearts 3 guides hub for more tips and strategies, including where to find Orichalcum+ for the Ultima Weapon, and how to upgrade keyblades.